A boiler is a device designed to produce steam or heat water and can be used to provide space and water heating for houses and buildings. Most of the heating systems use the natural gas-fired burner as the main heating source. Some of the heating systems use oil fired burners and electric resistance heaters instead. In some particular cases, steam can be favoured over hot water. Boilers have numerous advantages that have made them a standard component of buildings. Most of them have a long life and efficiencies that can rise to 95% or higher. Boilers are an effective way of heating a building and in the case of steam systems, they need minimum or no pumping energy. Steam can hold 5 to 6 times more heat energy than water. Generated at high pressure, it can produce high temperature and energy. 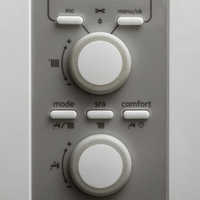 Steam is easy to control - it is environmentally friendly and hygienic. For this reason, a boiler is often considered as a valuable investment when looking for ways to reduce energy use and save money. If you want to compare boiler prices, we offer you a free, easy to use, without obligations service that, based on your preferences, will give you quotes from different boiler suppliers. You just need to fill in the form on the right. What Type of Grants Does the UK Government Provide? With regards to the cost of a boiler, prices range from £500-2,500. We offer a price range because the actual boiler prices are hard to predict. What determines the costs of a boiler are a number of factors such as, the type of boiler, the brand, size, and performance. You also have to take additional costs of installation into account. To give an example: If you are considering a combi boiler and you live in a larger sized home with two bathrooms you need to think about a medium to a large-sized boiler. The price for a medium sized combi boiler is usually around £1,000. These costs vary depending on whether you are replacing your current boiler with another of the same type or changing to a different kind of boiler, entirely. It also depends on the structure of your house. A new boiler might mean some structural changes, like moving pipework. Finally, the costs will also depend on the company that will take care of the installation. It can pay off to do some research beforehand to find a reputable company. Installation costs range between £500-1,500. The UK Government established a scheme aimed at lowering energy costs and carbon footprint for low-income households, by granting them access to efficiency improvements. That scheme, called ECO, offers free boiler replacement to homeowners who meet certain requirements. Broadly, it’s necessary to be a recipient of a specific combination of income-related benefits (which includes tax credits, income supports, ESA or JSA) and to have a boiler at least over 5 years old (not condensing) to be able to qualify for the grant. Read more at OFGEM's website. The key elements of the boilers involved in this process are the burner, combustion chamber, heat exchanger, and controls. This element of the boiler has a significant role in commencing the combustion process inside the boiler. It receives signals and notification from the temperature sensors when the heat needs to be generated out of the system. This iron component is where the burning process takes place. It is intended to be resistant and experience intense heat energy that can reach very high limits in a short period. Produced heat is afterwards transmitted to the heat exchanger unit. Several fuel pipes are used to filtrate the liquid inside the combustion chamber. In the next step, water is pumped through pipes to heaters or radiators that emit produced heat energy. Boiler control helps in the production of hot water or steam in an efficient and safe manner. It controls and monitors boiling water temperature or steam pressure and controls the firing rate. Both oil and gas fired boilers operate by using controlled combustion of the fuel to warm water. Fuel and oxygen are combined in the burner and with the help of ignition devices, they create a platform for combustion. The process of combustion is held in the combustion chamber which transfers generated heat to the water through the heat exchanger. Controls are used to adjust the ignition, the burner firing speed, supplies of fuel and air, steam pressure and water temperature. Hot water is further pumped through the pipes and transferred to equipment throughout the building, which can include hot water coils in air handling units, service hot water heating devices and terminal units. Steam generated by steam boilers circulates through the pipes from areas of high to low pressure, without help from external power sources. In the following paragraphs, different types of boilers are explained and more details on design and particular boiler systems are provided. The working principle of the firetube boiler is based on hot gases of combustion that circulates through a range of pipes surrounded by water. The design of the firetube boiler is ancient, and it was mainly used during the 18th century for steam locomotive engines. The fuel is burnt inside the furnace. Produced hot gases flow through the fire tubes immersed in water inside the main vessel of the boiler. The heat energy generated by gases is transferred to the water. As a result, steam is generated from the water and transferred further for the required purpose. The watertube boiler uses water flows inside the tubes that are placed in the hot gases from the fire. This system works contrary to the firetube boiler, where gases are passed through tubes surrounded by water. Watertube boilers commonly exist in bigger sizes comparing to firetube boilers. Their size can go up to a few million pounds per hour of steam generated. They are efficient in handling steam pressures and designed to attain intensely high temperatures. The big difference in types of boilers is the fuel used to heat the water. The frequent practice is to name boilers based on the type of fuel they burn. It can be gas, oil, electricity, renewable energy or solid fuels such as coal and wood. Natural gas is one of the most popular fuel sources, prepared from methane mixed with a few other gases in smaller proportions. Gas as a fuel contains a minimal value of carbon and high value of hydrogen that results in the production of fewer greenhouse gases responsible for global warming. Condensing boilers are the most common type of UK homes and more energy and cost-efficient, as compared to other gas boiler costs. Oil boilers are mostly condensing boilers fuelled by oil instead of gas. Oil fuels contain lower carbon content that results in reduced emission of carbon dioxide. On the other side, oil produces high amounts of carbon dioxide due to burning. Oil boilers are often more expensive as compared to gas boiler prices due to their complicated burning mechanism. Use of electricity in a boiler system (electric boilers) offers various benefits such as compact design, light weight, and noise-free working system. In addition, it can be easily employed in diverse kinds of heating and cooling devices such as air conditioning systems. Renewable energy sources can be used as boiler fuel. Most common ones are biomass, wind and solar power. This way of heating is extremely useful for people living in distant regions where additional fuel sources are high-priced or difficult to achieve. Solid fuels include coal and wood. Prior to the emergence of fuel oil, they were the only accessible fuels. As compared to other fuel types, the use of coal and wood results in more dust, ashes, and emission of polluting ingredients. There are several advantages of home heating boilers as compared to other home heating systems. Cost: boilers are cost effective. While initial costs of installation are high, operating costs are much lower compared to other heating systems. Year based savings can be as much as £310 on your energy bills. Space: boilers are often smaller than other types of heating systems. Combi boiler can even be installed on the wall instead of taking up floor space. Additionally, newer boilers are smaller in size than older models and will take up much less space in your home. Environment: boilers are considered a top choice when it comes to environmentally friendly heating solutions. 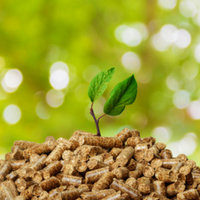 Boilers can use renewable sources such as pellets of recycled materials or biodiesel that are carbon-neutral fuels. Installation: boilers are easy to install with the minimum of disruption. Installation should be performed by licensed technicians. Choosing the right boiler is not an easy task. Whether you are opting for a gas, oil or biomass boiler, the decision will be made based on what is most suitable for your property. The principal issues are: available space, accessibility to the main gas source, the size of your property and availability of wood pellets in your area. Should I Consider Installing a Condensing Boiler? When possible, it is most effective to install the highest efficiency type of boiler. However, there are some rare situations when installation of Condensing boiler is not recommended. Since March 2008, installation and replacement of oil and gas boilers need to be condensing according to the Building Regulation in the UK. How Do I Find a Certified Boiler Installer? It’s mandatory that the installer is Gas Safe registered for gas and LPG boilers, and recommended he is OFTEC registered for oil boilers. The Gas Safe Register is the only official institution that registers gas engineers as being able to conduct safe works on gas appliances such as boilers, cookers, fires and other devices. Therefore you need to make sure that the company you hire is indexed in this register, it is for your own safety as manipulating gas appliances can be dangerous. Combi or Combination boilers are capable of providing both hot water and heating within your home. It is a combination of a conventional boiler for radiators and an independent water heater in one unit. Hot water is available instantly but it might require some time to heat. Condensing boilers use less fuel and have low operational costs, as compared to other home heating systems. During the burning process of oil and gas, hydrogen locked within their chemical structure links with oxygen in the air and form water. 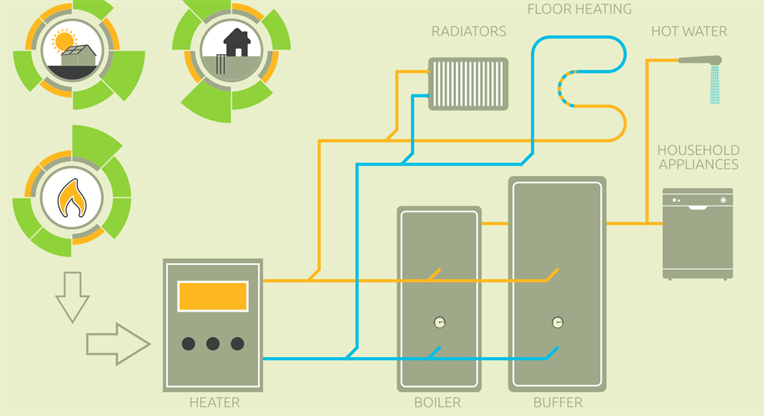 Generated steam or vapour contains about 8% of the total fuel’s energy which makes modern boilers highly efficient. The efficiency of a boiler decreases over time. The majority of boilers available nowadays will have efficiencies greater than 90%. Replacement of older type of boilers will result in fuel savings of more than 25%. Moreover, energy bills will be reduced by a quarter. A 24/7 boiler operation, sooner or later may lead to an increased wear of the system, that at best might prevent a homeowner to make the most out of his/her boiler, and at worst, pose a safety risk for others in the house. Thus, in order to make sure that a boiler will run as smooth as possible, it is necessary to carry out a boiler service on a regular basis, preferably during the summer, when the boiler is used less. 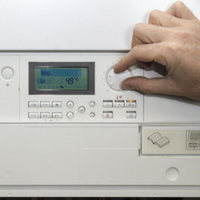 As a general rule, the boiler manufacturers provide their customers with a detailed instruction that contains all the necessary information regarding the way the boiler service should be carried out. In addition to this, some of the instruction manuals would also describe the type and the frequency of works required for various parts of the boiler. Undertaking a boiler self-service would not only be a risky venture but also technically impossible, as one might not have the required knowledge and tools to perform such an activity on his/her own. Boiler burner inspection: diffuser, electrode igniter, flame sensor cleaning. It also includes the blowing of the air sensor, which controls the mixing of gas and air. Simultaneously with the above-mentioned works, a washing is performed and if it is necessary, the gas filters might be replaced as well. The combustion chamber inspection: at this stage, the cleaning of the boiler’s internal parts that come in contact with the burner’s flame is performed. Gas pipes inspection: it specifically refers to the cleaning of flues. It is worth mentioning that the cleaning of the chimney is not included within this process. If necessary check and repair the boiler’s electrical components. Boiler’s units adjustment, including the burner as well. A complete list of the elements that require an inspection on a regular basis, shall be specified in the service manual. Conducting an analysis of the composition of exhaust gases, that will make the engineer understand whether the boiler’s burner is set to work with a particular fuel type and if it results in a proper combustion. Testing the boiler’s safety system: it is of utmost importance that a considerable attention is given to the evaluation of the boiler’s safety features by simulating certain emergency situations that could happen while operating a boiler. Testing the boiler’s shut-off valve: making sure that the valve functions as required and that it is hermetically tight preventing any possible leakages. Careful examination of the supply pipeline, that is the responsibility of the house owner. During the inspection, the owner or the person in charge should focus on identifying the spots on the pipe that are prone to corrosion, checking the tightness of the available connections (flanged, threaded, welded) and if necessary paint the gas pipe. If you need help with finding the right supplier and want to compare boiler quotes, get in touch with GreenMatch! We will provide you with up to four quotes from our reliable suppliers to make your boiler comparison research much easier.